In our limited testing, Air Display 3 used over USB worked well, with little lag, and its performance was comparable to Duet Display. There’s still an option to connect over WiFi if USB is not available, but using WiFi was considerably more unreliable with a lot more of a delay when attempting to perform tasks. What Are The New Features In Air Display 3? USB: They have added USB. You can still communicate over Wi-Fi, which is very useful in some cases and allows you walk around untethered, but you can also plug in your dock connector and see much faster performance with no perceptible lag. This is great for using Air Display in locations with a hostile Wi-Fi network, like hotels, coffee shops, airplanes, and some corporate and campus networks. Pressure: They are retiring their Air Stylus iOS app and rolling all of its features into Air Display 3. Now you can draw with your favourite pressure-sensitive stylus directly into a Mac app like Photoshop or Motion. In Air Display 3, they have added support for all of the latest styluses and on iOS 8, you don’t even need a stylus, just tilt your finger to simulate pressure changes. Pinch-Zoom: You can use familiar gestures to zoom and pan, which is quite handy at Retina resolutions and makes the iPhone a useful second display. Speed: USB speeds up the Air Display connection a lot, but Air Display 3 also dramatically increases performance over Wi-Fi. 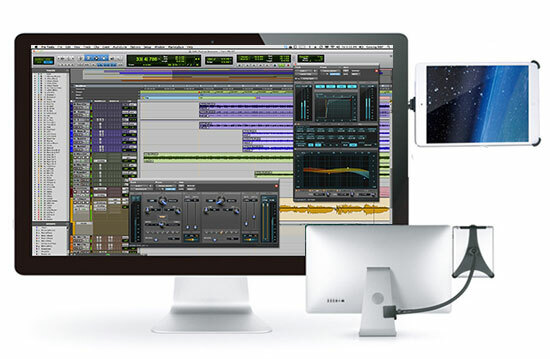 Multiple Monitors: Air Display 3 connects up to 4 iPads simultaneously for powerful multi-monitor configurations. Keyboard: Type using Air Display’s built-in keyboard or any Bluetooth keyboard. Cross Platform: The free Mac host app is not just for iOS; it can also connect to our Air Display clients for Android, Mac, and Windows. Touch Gestures: You can control your Mac with intuitive iOS gestures: tap or drag to operate the mouse or tap, two fingers to right-click, drag two fingers as a scroll wheel. HiDPI: Choose Normal, Retina, or HiDPI resolution to suit your taste. For the moment Air Display 3 is only available in the App Store for Mac users, Windows users can still get Air Display 2, but they will be releasing a Windows version of Air Display soon. They are also intending to create an App Bundle to enable Air Display 2 and Air Stylus users upgrade to Air Display 3 for a discounted price. Users will also need to download a free Mac app from the Avatron website to connect their iOS devices to their Macs.